We don't care how good your hair looks or how much time you spent styling it. When debris starts raining down, you'll want a good helmet. Doesn't matter if your Special Weapons and Tactics, an armored cop, Armed forces, or are besieging the cardboard fort in the back yard: head protection is a must. 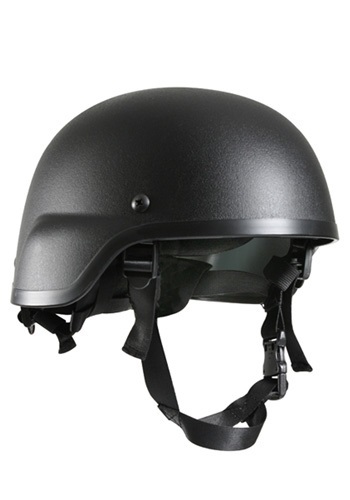 This Black Tactical Helmet is just what you need. Dark. Shiny. Super-official looking chin strap and all. It's the perfect top-off to any military or enforcement costume. Note we said costume. This is for dress-up and play. This helmet will not actually protect you from anything dumb you decide to do. Like an insertion through the roof via that trampoline over there... so don't do it. Bought it to replace the helmet that came with my son's swat costume and this one was much better.